The Santa Maria Inn, a north county institution since 1917, was the brainchild of Frank J. McCoy, one of Santa Maria’s most esteemed citizens. McCoy was born in 1879 while the family was on a visit to Ireland. He largely grew up in St. Louis, and then attended the University of Missouri for two years before ending up in San Francisco in 1900. In 1901, he accepted a position with the Union Sugar Company in Betteravia. He steadily rose through the ranks, and, after making a profitable investment in ranch land, he left the company in 1916. Still in his thirties, McCoy cast about for another challenge. He saw that automobile travel was increasing yearly in California and felt that a well-run hotel in the Santa Maria area would have great appeal to those making the long trip between San Francisco and Los Angeles. He purchased a property on the southern edge of Santa Maria with substantial highway frontage and, on May 19, 1917, the Santa Maria Inn opened for business. The inn was a success from the get-go. Each of the hotel’s 24 rooms had its own bath. McCoy transformed the grounds into a wonderland of color; the cactus garden won international acclaim. McCoy saw to it that the dining room and every guest room were supplied with fresh flowers daily. The hallways and lobby became showcases for McCoy’s collection of pewter and copperware, as well as his assemblage of works by California artists, including cowboy artist Ed Borein. 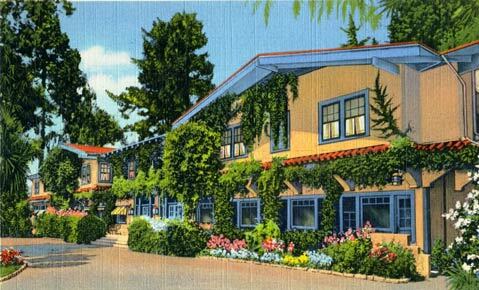 Such was the success of the inn that by 1928, the proud owner had expanded the hostelry to 85 guest rooms. 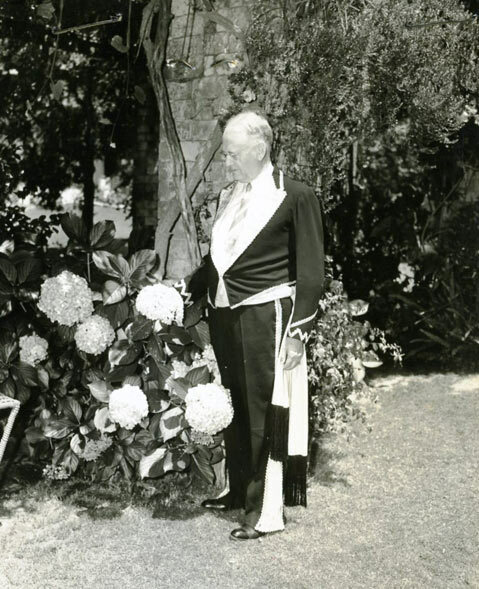 Frank J. McCoy, founder of the Santa Maria Inn. Mary Pickford, Charlie Chaplin, Douglas Fairbanks, Rudolph Valentino, and Jimmy Stewart were just some of the luminaries who came up from Hollywood. Sports figures such as baseball players Willie Mays and Joe DiMaggio stopped in, and from the political arena, guests included Herbert Hoover and Richard Nixon, the latter spending part of his honeymoon at the inn. McCoy became an active and influential community presence in Santa Maria. He served on the high school board for 25 years and was instrumental in pushing through the construction of Santa Maria Union High School. He was a member of both the Santa Maria and Santa Barbara County planning commissions and was associated with a number of countywide health organizations. He was one of the prime movers in convincing Cecil B. DeMille to film his 1923 production of The Ten Commandments at the Guadalupe sand dunes nearby. Radio station KCOY and, later, KCOY-TV were named in his honor. After McCoy’s death, a nephew took over the inn, and over the years added more units, a coffee shop, and a swimming pool. The inn went through some tough times in the late 1970s, closed for a while, then reopened in the early 1980s under new ownership. Today, the inn offers more than 160 guest rooms for weary travelers as it closes in on its 95th anniversary.